Ra-Jac Air can handle your Air Conditioning, Heating, Ventilation and Air cleaning needs from large commercial and industrial applications to residential and light commercial work in all of Galveston County Texas and most Harris County TX Areas. Our trained technicians can get your system up and running quickly and since all our service technicians are highly trained and have at least 10 years experience, you can be sure that your unit is fixed right the first time. For more information on why you should choose our services see five reasons to choose Ra-Jac. Services - We Offer a wide variety of services including those listed below. Free Estimates - We provide free estimates on new installations of residential, commercial, and industrial systems. Also, on repairs, once our service techs locate the problem they can give you a flat rate price on a repair before they begin the repair, eliminating the guesswork and allowing you to relax knowing the repair will be done right and for a set price. For free estimates in the Galveston County and NASA area call us now at 409-945-4171. For more information check out our free estimates section. Retrofitting - Why throw out a perfectly good system when you can reuse it. Some systems can be retrofit to use newer refrigerants and components extending the life of the system and cutting costs. Allow us to evaluate your system to see if retrofitting is right for you. Sales - Are you a do it yourselfer? 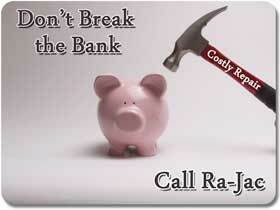 Allow Ra-Jac to supply you with high quality parts and equipment for your home improvement or commercial repair needs. 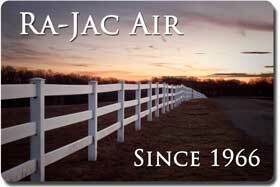 Shop from Home - Ra-Jac Air is also currently offering a variety of products available at the Online Shopping section of our web site. Maintenance and Service Contracts - You can always count on Ra-Jac Sales and Services to quickly respond to your emergency service requirements but you should probably consider a preventative maintenance service agreement. Almost everyone can benefit greatly from a maintenance program because it can not only help to prevent many unscheduled visits but it can also save you money over the course of the year in decreased energy costs, fewer and or less severe breakdowns, longer life for your equipment and better air quality which leads to better health and fewer sick days. There's no better way to keep your air conditioning, heating sand air cleaning system operating smoothly and at top efficiency than regular preventative maintenance. We offer solutions - We can offer solutions for difficult problems like air borne allergies, dust and dust mites, hot and cold spots, cutting high AC and heater energy costs, carbon monoxide leaks and detection, lost efficiency, duct leakage, custom duct work design, zoning or zone air systems, air filtration, air cleaners and purification systems, dehumidifiers and humidifiers, digital and programmable thermostats, service agreements, annual inspections, and many other problems. We offer special financing for new installation and accept cash, checks, and most major credit cards.